Stocked with four points of micro-adjustments, a controlled resistance unit and a frame suited for Tour de France stage-ending sprints, the Phantom 5 is built for top professional athletes — yet easily adaptable for any level of rider. Plus, the onboard PowerTap power meter lets you know exactly how hard you're working. Bluetooth Smart and ANT+ compatible. Controlled resistance technology allows precise regulation of power, slope, or gearing. PowerTap technology provides +/- 1.5% accurate power feedback. Seamlessly integrates with CycleOps VirtualTraining. Controlled resistance allows you to target power, slope or gearing. Precise resistance control lets you dial up the difficulty level for any workout intensity. PowerTap power meter provides +/-1.5% accurate power feedback. Freewheeling hub lets you stop pedaling and coast whenever you need to recover between efforts. 48-pound flywheel makes the unit ride and look like an outdoor bike, while the rear-location keeps it out of the "sweat zone". Complimentary 2-Week Free Trial for CycleOps VirtualTraining included. Includes a mini ANT+ USB stick for use with desktop version of CycleOps VirtualTraining. The Phantom 5 is intended to be used with an iPad or Android tablet running the CycleOps VirtualTraining application and does not come with a computer. The Phantom 5 is compatible with most ANT+ CycleOps or PowerTap products such as the Joule GPS, but doesn't work with the CycleOps Cervo (a.k.a. the little yellow computer) or Joule 1.0. Buy CycleOps Phantom 5 Indoor Cycle - FREE SHIPPING! Controlled resistancetechnology allows precise regulation of power, slope, or gearing. PowerTap technologyprovides +/- 1.5% accurate power feedback. 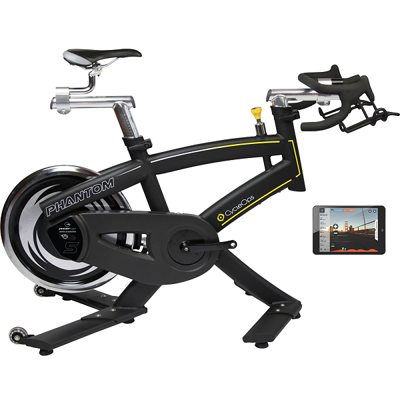 The Phantom 5 is intended to be used with an iPad or Android tablet running the CycleOps VirtualTraining application and does not come with a computer. Please see here for further compatibility and required ANT+ adapters. The Phantom 5 is compatible with most ANT+ CycleOps or PowerTap products such as the Joule GPS, but doesn't work with the CycleOps Cervo (a.k.a. the little yellow computer) or Joule 1.0. Contact us if you have compatibility questions.